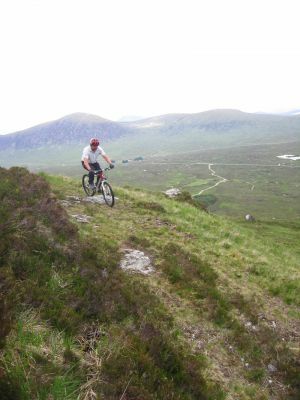 Ski centres across Scotland and abroad have been slowly re-inventing themselves to extend their trading into the summer season to satisfy the growing demand for centre based mountain biking. 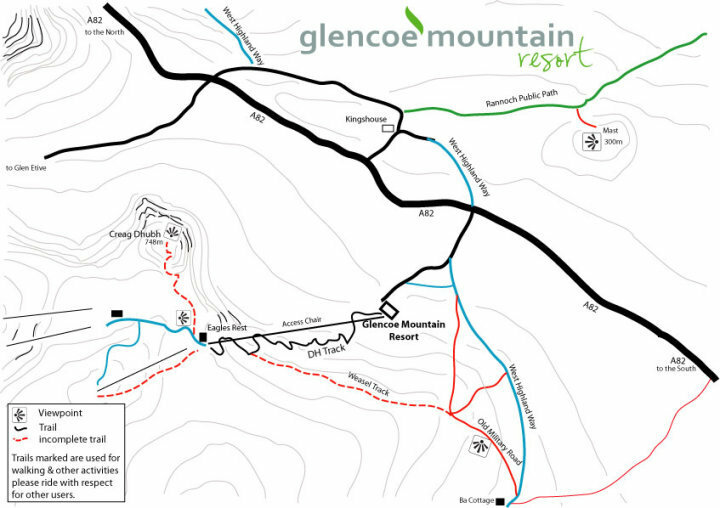 Glencoe Mountain Resort is no exception. 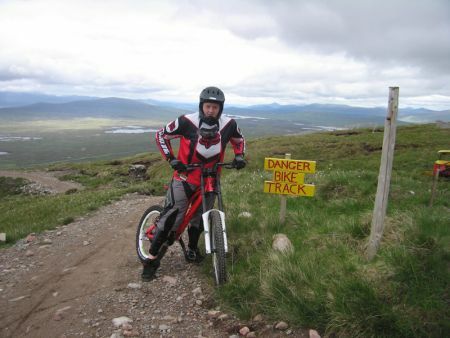 Downhill mountain bikers have been riding the black downhill track at Glencoe for a number of years. Steep and technical, it has gained a fairly fearsome reputation. 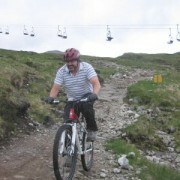 However, under the guidance of new management, the possibilities for mountain biking are being expanded. 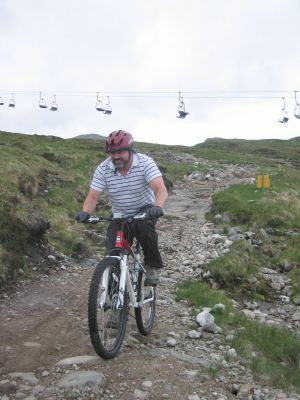 Using the chairlift for access, the old weasel track (so called because of the old truck used during the construction of the ski centre many years ago) is a more realistic option for mere mortals. 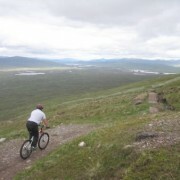 At the time of writing the trail is in a fairly natural state, but still a good descent for more confident riders. 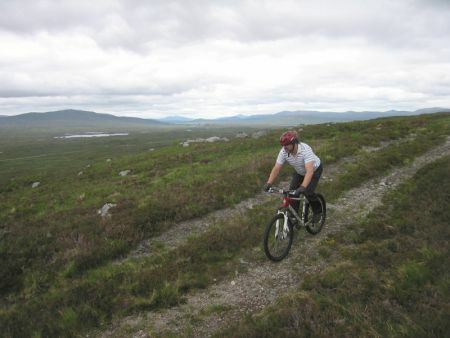 But plans to formally develop it into an easier grade bike track are being considered. 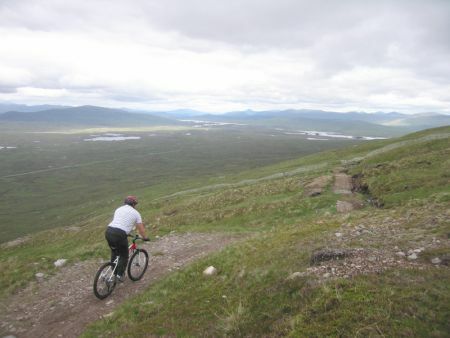 With chairlift access and the spectacular setting high above Rannoch Moor, this would create a bike route of some character. 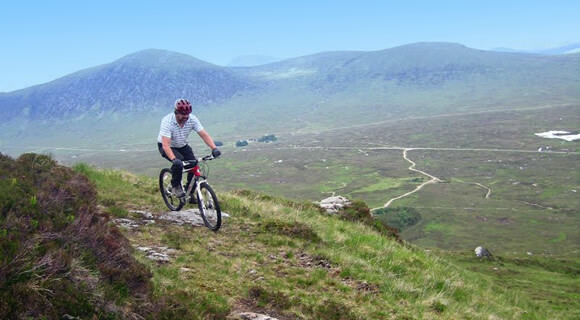 Glencoe Mountain also provide bike hire, with both cross country and downhill bikes and accessories available during the biking season. 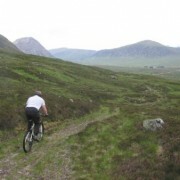 Other biking possibilities at Glencoe Mountain include exploring the West Highland Way and the other rough tracks beyond Kingshouse onto the great expanse of Rannoch Moor. 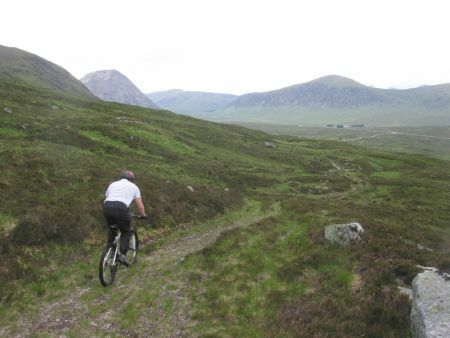 Alternatively, you could choose to use the centre as a base for exploring the quiet road down Glen Etive. 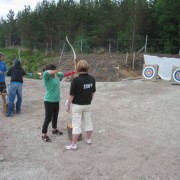 For more information see the Glencoe Mountain web site. 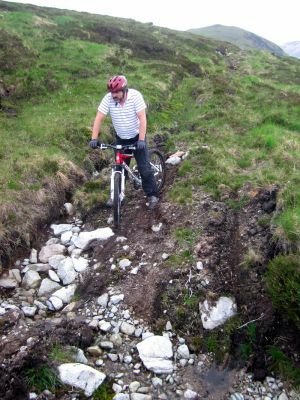 Glencoe Mountain Resort has already got a reputation for mountain biking with a black downhill track already established. 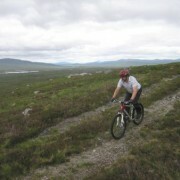 But there are plans to develop the biking further, and in particular, the weasel track. 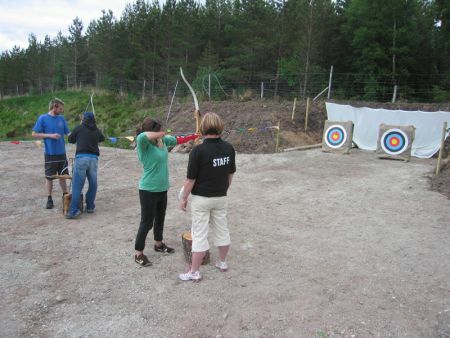 These photos were taken on an exploratory trip in June 2010. 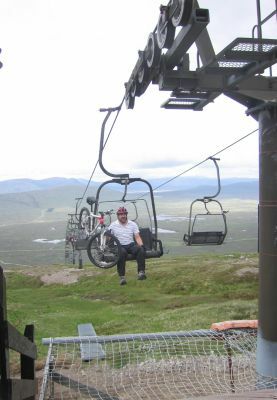 Take your bike on the chairlift. 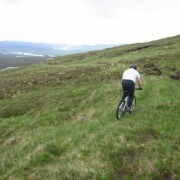 It beats riding it uphill! 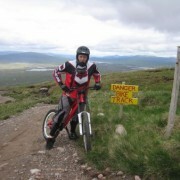 Preparing to tackle the black downhill mountain bike track. 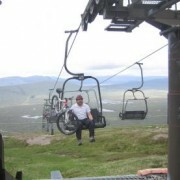 Heading down from the top of the chairlift - leaving the plateau behind at Glencoe Ski Centre. 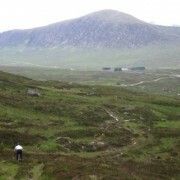 The view opens out over Rannoch Moor. The weasel track proper starts just beyond the visible deer fence. Some sections of the track are really very good already. 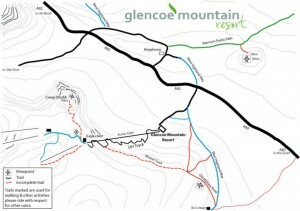 The access road to Glencoe Ski Centre is just visible below. Some sections are a little back to nature. Inevitably, some sections have been washed out and are in need of some maintenance. 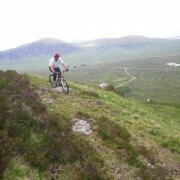 Once at the bottom of the weasel track the return to the Glencoe Ski Centre car park is on the old military road. 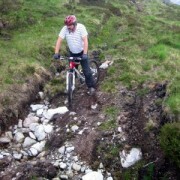 Excellent mountain biking. 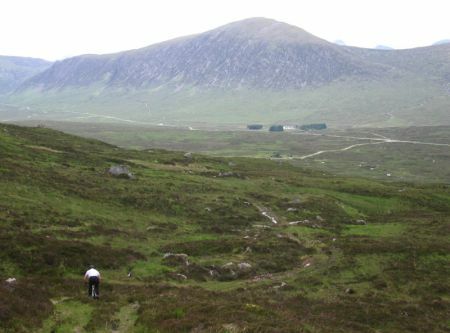 Buachaille Etive Mor coming into view. Kingshouse Hotel and the A82 through Glencoe visible in the distance. Nearing the end of the track.